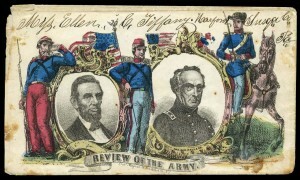 The featured article from the April issue of the American Philatelist, “The U.S. Civil War in Contemporary Illustrated Material,” by Eliot A. Landau, mentions an exhibit available from the APRL. The complete exhibit is not yet available, but we have acquired scans of the items from the exhibit and you can view them on the APS website in the AP bonus content area. The article mentions covers and songsheets produced by Charles Magnus. The Winterthur Library has a collection of Magnus material, including covers and lettersheets. A finding aid for the collection is available on their website.